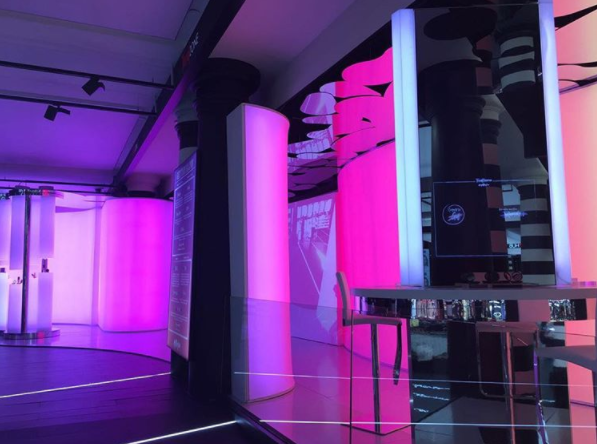 Augmented Reality experience for Sephora flagship in El Triangle mall, Barcelona. Body tracking, computer vision and a huge projector was necessary to create an interactive experience where you could draw with light in the air just using make-up brushes. The intallation also captured animated gifs of your experience and you could share on social media. The experience was implemented using Microsoft Kinect for body tracking, OpenCV for blob tracking and the Unity3D game engine. I designed a realtime procedural mesh generation system, body tracking, blob tracking and shading. I also developed a social media sharing system meant to share animated GIFs that the applications generates while playing with it.